One of the most useful schemes developed for understanding general topographical anatomy, was devised by the German Botanist, Julius von Sachs (1875). His classification system has a great deal of merit - firstly, because it was relatively simple, and second, due to its wide applicability to the juvenile and young leaf, stem and root. (3) the remaining non protective and non-conductive tissues, which make up the fundamental or ground system. the evaporation of water, a process that drives the transpiration stream, and concomitantly, aids cooling of the leaf in hot conditions, whilst available transpirational water is not limiting. Each of these functions is either initiated or takes place directly in the mesophyll leaves. Leaves have vastly differing internal structure and this is demonstrated by the mesophyll cells which are arranged in different patterns and locations, which may be ascribed directly to the functional processes of the photosynthetic cycle occurring within the leaf. Leaves of dicotyledonous plants differ greatly from those of monocotyledonous plants and to those of gymnosperms. Of course, there is some degree of intergradation, but generally, it is possible to separate these leaves, using some basic diagnostic criteria. Dicotyledons generally have a mesophyll which is composed of two differing photosynthetic cell types - palisade and spongy mesophyll cells. Leaves may be isolateral, isobilateral, dorsiventral or even needle-like in cross-section. Whatever the leaf shape, chloroplasts are concentrated within the cytoplasmic matrix of these cells and, for the most part, the majority of the chloroplasts are to be found in the upper palisade mesophyll cells. Mitochondrial populations in these obviously-photosynthetic cells may be high as well. TRANSLOCATION in plants involves movement of water and dissolved inorganic nutrients through the xylem from roots to the aerial parts of the plant, and the transport of photoassimilated material from sites of synthesis (source) to sites of utilization (sink) via the phloem. This transport occurs in a vein network, termed the major and minor vein network. In mature leaves the minor veins are involved in the uptake of assimilate from the mesophyll and transport of these assimilates towards the larger veins, then the major veins, out of the leaf, and into the stem vascular system. Water transport essentially follows the reverse pathway. The xylem is responsible for apoplasmic transport in vascular plants, which is not limited totally to water transport, but in addition, the transport of various macro and micronutrients, amino acids and other important inorganic substances, from the roots to the stem and ultimately, the leaf via the apoplasmic continuum. The phloem is responsible for the transport of the major proportion of soluble carbohydrate as well as other essential products. The phloem forms the major long-distance symplasmic transport pathway in all vascular plants. Translocation usually takes place from a site of synthesis of assimilated material (called a source) to a site or sites of utilization (called sinks). The assimilated material is translocated in a water-based medium, which emphasizes the essential inter-relationship between the xylem and phloem, more particularly so in the leaf where most of the phloem loading takes place in mature plants. In many species, the companion cells are highly modified, with a very high frequency of plasmodesmata between the bundle sheath cells and the intermediary cells. The intermediary cells are distinctive in that they often contain numerous small vacuoles, and a large population of mitochondria. These plants synthesize sucrose during photosynthesis, and the sucrose is transported to the intermediary cells, via the numerous functional plasmodesmata. Once in the intermediary cells the sucrose is converted to larger raffinose-family oligosaccharides (RFOs). which cannot leak back out from the intermediary cell, and are trapped, increasing the osmotic potential, and causing the larger polymer to move into the sieve tubes, and thus transported to other regions of the plant via the phloem. Click here to see an electron micrograph of a minor vein with intermediary cells. 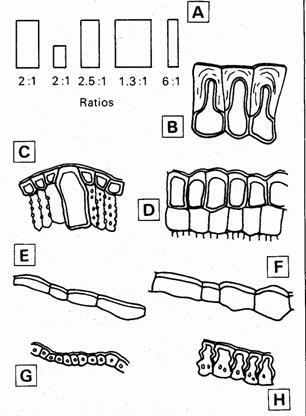 Turgeon R, Beebe DU, Gowan E (1993) The intermediary cell: minor-vein anatomy and raffinose oligosaccharide synthesis in the Scrophulariaceae. Planta 191: 446–456, and literature cited. TRANSPIRATION is the driving force that facilitates the movement of solutes through the xylem. Transpiration requires that water entry is facilitated at the roots. Efficient transport must occur in a conducting system, in order that water may be translocated to other regions of the plant where it is utilized in numerous biochemical and growth-related reactions. The xylem is also the principal pathway through which water is translocated from point of entry, to a point of exit, which in higher plants is via stomata , by the process of transpiration . Transpiration itself facilitates leaf cooling by evapotranspirational heat loss to the atmosphere. Thus the physiological necessity of regulating transpirational water loss, via the cuticle, the epidermis, and the stomata, have made changes in the surface embellishment of the cuticle, changes in the size of epidermal cells, and alteration of stomatal cells necessary. Leaves can be classified in various ways, for example by their shape and size, their texture and colour, the degree of hairiness, to name but a few. These variable features are frequently reflected in different internal tissue arrangements. Some modifications are typical of plants that grow under particular conditions, but other may owe more to the genome than to the habitat which the plant occupies. In general terms, all leaves have the similar features -- an epidermis, mesophyll, vascular tissue and stomata. However, the arrangement of these four components is, to a large extent, dictated by the physical environment - water availability, light intensity and ecological niche. Thus it is the interplay of these environmental parameters which serve to modify leaf structure. The epidermis may, for example, be simple or compound, there may be either a thick or a thin cuticular covering, there may be a hypodermis associated with the epidermis, stomatal distribution may be amphistomataous (stomata on both sides of the leaf) or hypostomatous (stomata on one side of the leaf only) and they may be raised above the general leaf surface, flush with the leaf surface, or in some cases, sunken into crypts. The ground tissue (mesophyll) may be specialized or unspecialized. 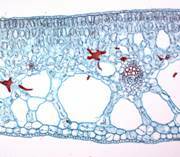 If specialized, a palisade or spongy layer may exist and in some leaves, palisade tissue may exist on both sides of the leaf (isobilateral) as is the case in many succulents. The mesophyll may be compact, with few intercellular spaces as in xerophytes, or may contain a large intercellular space volume, as in some mesophytes and hydrophytes. Generally speaking the major groups of vascular plants – the gymnosperms, and the angiosperms, represented by the dicotyledonous and monocotyledonous plants have key features that help us identify them, with a high degree of success. The three images below, illustrate aspects of structure of leaves that are common to groups of plants that live partly submerged, with floating leaves (left), on land under conditions of adequate rainfall (middle), and high stress (right). The water Lilly (Nymphaea) leaf shows many features common to plants with floating leaves. These plants are called hydrophytes. The most prominent here, are the large intercellular cavities that maintain buoyancy and facilitate good aeration. The Ligustrum leaf shows features of the majority of land plans, living in regions of adequate rainfall- perhaps high sunlight stress during summer (hence the red stained cells in the mesophyll, which contain tannins). This mesophyte has good aeration through a large body of interconnected intercellular spaces. The image to the right is a detail of the leaf of Hakea which is a typical South African fynbos plant. It survives harsh dry summers (high light intensity, high temperatures, low humidity) without rainfall, so the leaf is engineered to withstand high water stress, and it therefore contains a great deal of mechanical supporting tissue, to prevent leaf collapse during extreme dry conditions. Leaves function by drawing water up the xylem, from the roots, into the leaves, where most of it is lost through transpiration. The phloem contains cells called sieve tubes through which assimilated material is transported from the source leaves to sinks, where the carbohydrate is used in many of the biochemical reactions that occur within plants. Many leaves are flattened dorsiventrally. The leaf of Ilex aquifolium, in Fig. 3.1 in T.S. and surface view, serves to illustrate general dicotyledonous foliage leaf anatomy. In this example, the epidermis forms the boundary between the atmosphere and the underlying mesophyll and vascular and non-vascular tissues. Its cells are specialized for this function. The epidermal cells are covered by a thin cuticular layer. In this dorsiventrally compressed leaf, the upper and lower surfaces are different, as can be seen from Fig. 3.1 A-C. Stomata occur among the cells of the lower (abaxial) surface only, the leaf is thus hypostomatic (see Fig. 3.1 D). The mesophyll consists of chlorenchymatous, palisade-like cells on the adaxial side with few intercellular spaces, and of more loosely arranged spongy cells with larger intercellular spaces on the abaxial side (Fig. 3.1 C). Part of the vascular system is shown, including the large midrib bundle (Fig 3 A) and in more detail in Fig. 3B. A smaller secondary vein is illustrated in Fig. 3 C. In all leaf blade vascular bundles, phloem occurs to the abaxial, and xylem to the adaxial side of the leaf. The larger and many of the smaller vascular bundles frequently have a cap of sclerenchyma cells associated with the phloem pole only. Fig. 3 Ilex aquifolium leaf T.S. and surface. A, low power (x22) diagram of midrib region, A-B and C-D indicate where detailed drawings B and C were taken. B, detail of midrib T.S. x 130. C, detail of lamina, T.S. x 130. D, abaxial surface x 200 a, air space; ab, abaxial epidermis with thick outer wall; ad, adaxial epidermis with thick outer wall; cr, crystal; h, hypodermis; m, midrib bundle; p, phloem; pm, palisade mesophyll; s, sclerenchyma; sm, spongy mesophyll; st, stoma; vb, vascular bundle; x, xylem. In the monocotyledons (Fig. 3), the epidermal cells are usually elongated along the axis (i.e. along the plane from base to tip of the leaf) and form fairly simple patterns. Epidermal cells are interspersed with stomata. Fig. 4. Monocotyledonous leaf surfaces. A, Iphalaris canariensis, x 240. B, Kniphofia macowanii, x 80, note cuticular pattern. C, Arundo donax, x 120, note microhairs.D, Clintonia uniflora, x 70. E., Smilax hispida, x 150. F, Gloriosa superba, x 54, note elongated costal cells over vein and cells with sinuous walls between veins (intercostal cells). m, microhair; p, prickle hair; si, silica body. Fig. 5 Strengthening tissue in the leaf, as seen in T.S. Sclerenchyma in Agave franzonsinii, A and B; Aegilops crassa C and D; Phalaris canariensis, E. a, outline of leaf T.S. to show location of diagram B, x 40. C, leaf margin, x 109. D, x 109 and E, x 230, vascular bundles and their associated bundle sheath s and girders. adg. adaxial sclerenchyma girder; abg, abaxial sclerenchyma girder; c, chlorenchyma; is, inner bundle sheath; ms, marginal sclerenchyma; mx, metaxylem; os, outer bundle sheath; p, prickle hair; ph, phloem ; vb, vascular bundle; x, xylem. Mature leaves may contain additional marginal strands, sclerenchyma" of sclerenchyma, and some fibre strands or girders may be associated with the vascular bundles in Aegilops crassa, Phalaris canariensis and Agave franzosinii. Collenchyma is frequently present in the raised ribs above and below the midrib bundle, and is also occasionally found in similar positions in relation to the large and intermediate vascular bundles in monocotyledons as illustrated in Fig. 4 D, where ad- and abaxial hypodermal sclerenchymatous girders subtend this large bundle. Fig. 4 E shows an intermediate vascular bundle, in which the adaxial hypodermal sclerenchymatous girders extend, and are associated with prickle hairs on the upper and lower leaf surfaces. It is important to note that the hypodermal strands or girders found in leaves of the Poaceae and Cyperaceae for example, may become sclerenchymatous in mature leaves. Stomata may be superficial, that is, with the guard cells level with the surface of the leaf , or sunken, with a small outer chamber above the guard cells. Although many xerophytes have sunken stomata, and the majority of mesophytes superficial stomata, this is not invariably the rule. There may be particular adaptive advantages in each arrangement under certain circumstances; it may not be clear why some apparently 'unadapted' species survive while others around them are modified to a greater or lesser degree, but the timing of leaf emergence and their fall, or physiological adaptations, for example, may also play a part. Fig. 6 A diagram of ratios of height to width; note how difficult it is to judge these by eye. B-H, epidermis of selected plants in T.S., x 145. B, Gasteria retata note the thick other wall and the outer part of the anticlinal walls. c, Dielsia cygnorum, note that some cells are larger than others. Measurements of epidermal cells have been made to try and distinguish between closely related species. If enough careful measurements are made and a statistical analysis carried out, significant differences may be detected. Unfortunately, this seemingly valuable method is limited in usefulness by the natural variation in size within different specimens of the same species, or even amongst cells from different leaves on the same plant. Sun and shade leaves, for example, can differ markedly in this respect. As mentioned, there are three different types of higher vascular plants, the first group of which are the Gymnosperms. Gymnosperms are primitive plants (as they have a naked seed, and their wood is composed of tracheids only); the second group called the Angiosperms, contains two types of vascular plants, the dicotyledonous plants, and the monocotyledonous plants. Anatomically, we can distinguish between them relatively easily, using some criteria that are applicable for the most part to either of the three, but not common to more than one group. The following table highlights the principal characteristics of leaves that are useful in that they may be used to help classify them into Gymnosperm and Angiosperm and in the latter case, into dicotyledon and monocotyledon foliage leaves. 5. The vascular tissue is associated with transfusion parenchyma, composed of tracheids and parenchyma cells. 6. A conspicuous endodermis surrounds individual vascular bundles. 1. Presence of a fascicular cambium between primary xylem and primary phloem IN THE MIDRIB ONLY. 2. Vascular tissue contains metaxylem and protoxylem VESSELS and TRACHEIDS. 3. Veins form a netted structure. 1. Vascular bundles primary only (closed, no fascicular cambium). 2. Vascular bundles contain large metaxylem (usually two vessels) as well as prominent protoxylem lacunae. 3. Larger vein are parallel to the margin of the leaf. The leaf is the principal photosynthetic structure in plants (except of course, for those that do not have leaves). Leaves contain numerous chloroplasts in which photosynthesis occurs. Leaves actively transpire water loss is via a process called transpiration. Transpiration reduced leaf temperature, and carries dissolved substances, including essential nutrients, up to the leaf mesophyll, from whence they are redistributed. Leaves contain vascular bundles, composed of phloem and xylem.